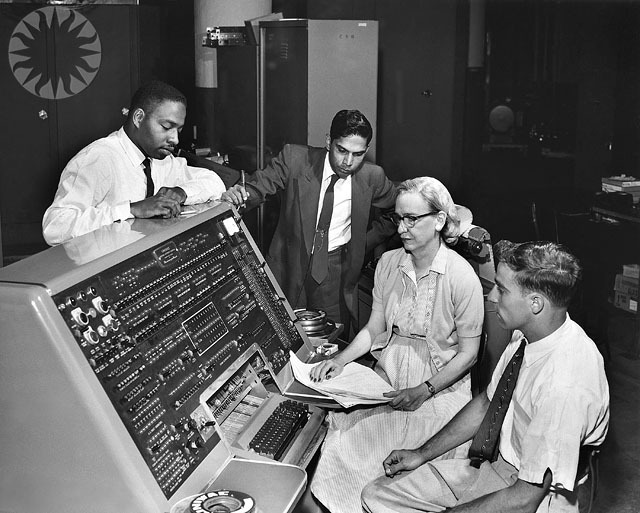 Where was this Grace Hopper/Univac photo taken? Description: Image shows operator's console of Univac I computer and four programmers. From left to right, Donald Cropper, K. C. Krishnan, Grace Hopper, and Norman Rothberg. Is it possible to know where this photo was taken? There couldn't have been very many Univac I computers that Grace Hopper would have been photographed with, and that distinctive-looking sunburst logo (watermark?) in the upper-left corner may be a clue as well. That's a non-starter. Before I give my guess, let's see what we have so far: Apart from the picture links in the question, we also have this link Grace Hopper demonstrating COBOL at Programming Department (Thank you @uoho). Most links places the picture as circa 1960 or 1957 and several also mentions COBOL. From the WW2DB link in the question, we can see that in this time frame Grace Hopper was working for Univac. The link above even places the picture at "Programming Department", the picture originated from Sperry Rand (Corporation), Univac Division and dates it as 1957-06, ie June 1957. The date is still a small problem. Even if I believe Hagley Digital Archives more than Wikipedia (Museum Curators normally don't give exact date without good backup evidence) it was impossible to have a COBOL class at that date, since COBOL was designed 1959 Wikipedia. So, either is the date wrong, or the COBOL reference a bit wrong. (It could have been during the work that led up to COBOL). All of the people in the picture are also in some other pictures from Hagley Digital Archives (you might need to search around a bit). This makes me think that all 4 people were at the time part of Grace Hoppers team at Sperry Univac. So, my best guess (until any more proof gets up) is that it was taken at Sperry Univac, at their "school room". Time somewhere between 1957 and 1960. But really that is just a guess. The Army and Air Force had systems as well, and Grace Hopper & Donald Cropper might have been sent over to those systems to help get things running. Not the answer you're looking for? Browse other questions tagged history identify-this-computer or ask your own question. Is this machine the EDVAC, MANIAC, or IAS? What computer was used in Weird Science? Which computer is used in this NCIS episode? What make and model is this 386 mainboard? Is the circuit board in this video a memory board? Does this computer have a steering wheel?